A quick follow-up to How much fuel was used for a Space Shuttle launch? My memory is a little foggy; I seem to recall reading the Apollo 11 mission commander depleted his reserve fuel landing Eagle. Apparently the landing was manual because the location designated was rocky. Most missions (unmanned, or otherwise) do a correction burn at some point. The duration of the burn being determined by the correction required - which will probably be known only after the mission itself is off-surface. The Apollo missions carrying human cargo, I would assume the volume of fuel to carry in reserve was calculated conservatively rather than optimistically. What was the process to calculate reserve fuel to carry on-board the Apollo missions in the CSM, and LM? Was it merely a rule of thumb - "Let's have 1% over-and-above the calculated figure" ? Apollo 11 landed with 45 seconds of hover time remaining, but there is some leeway in that number. Apollo 17 landed with 117 seconds of hover time remaining. There's an article by Paul Fjeld in the May/June 2013 issue of AIAA Horizons (PDF) newsletter which addresses the question of Apollo 11 reserve fuel. During the landing, you can hear the fuel level being called out ("30 seconds"), this was the time remaining until a decision to abort had to be made. In an emergency, the crew could ditch the descent stage and start the ascent engine (yes, in flight!). This abort procedure took some time (to prepare the ascent engine for ignition), so the descent engine needed to run for a few seconds after the abort decision. The availability of the abort option meant NASA could limit the amount of reserve fuel without jeopardizing the crew. 5-91 There are no trajectory or guidance constraints which are cause for abort after crew take over of powered descent. 25-12 The total continuous burn time of the descent engine shall not exceed 910 seconds of continuous operation independent of thrust level (based upon a lunar mission duty cycle). 25-18 If possible the DPS will not be burned to propellent depletion, where ever possible the abort stage sequence will be initiated at low level plus 20 seconds during an abort from powered descent, however, at crew option abort stage sequence may be initiated at low level if a safe abort stage capability exists. The crew had significant leeway, as long as an abort decision was made in time. The AIAA article also notes that fuel reserves were severely constrained by the weight budget (page 9). As early as 1963, discussions were going on regarding the amount of reserve to be carried. At one time, Grumman ran "Operation Scrape" in an effort to reduce weight of the LM. Remember that thanks to the rocket equation, every kg of fuel you land with carries a penalty of several kg of weight at the start of the descent, and maybe dozens of kg at liftoff from Earth. The fuel loaded in the Apollo LM was based on the expected amount of fuel needed in a particularly unfavorable scenario -- including an underperforming engine, a failed fuel valve, and a wishy-washy pilot -- plus an additional percent or two margin carried just because they could. The allowance for dispersions is determined from the Monte Carlo analysis mentioned previously. As can be seen in table II, the ∆V and propellant requirements are satisfied by a positive margin of 301 pounds. This margin can be converted to an additional hover or translation time of 32 seconds. It's unclear to me what "offloaded to minimize malfunction penalty" means; possibly this is just a lightening of the spacecraft stack in case the launcher underperforms its specifications. The DPS unusable consumables comprise approximately 1.2 percent of the total loaded propellant. As in the case of the SPS, the major contributor of unusables is that propellant which is trapped and unavailable. The other contributors are outage and gaging uncertainties. "3σ (sigma) dispersion" means that it's expected that 99.7% of the time, the nominal + dispersion fuel allowance will be sufficient to do an automatic descent. Additional allowance is taken for failure of one redundant propellant valve, which would reduce engine performance slightly. The triggering of the low fuel level warning light, according to mission rules, begins a countdown to abort; since sloshing fuel could vary the actual quantity remaining when the sensor trips, a little extra fuel is allocated to cover that uncertainty. Fuel is explicitly allotted for flying to a particular crew-selected landing area ("LPD operation" or "redesignation") and to hover to find a safe place to touch down. The hover time of 85 fps (26 m/s) is enough to cancel acceleration from the moon's gravity completely for 16 seconds. Beyond those explicit allowances, there's an additional 301 lbs (136 kg) of fuel left over, allowing quite a bit of additional hover time. Because all these contingencies were accounted for, the Apollo 11 landing was in a much less critical fuel state than is often believed. The propellant quantity light latched on early due to fuel sloshing, meaning there was somewhat more fuel left than indicated. At touchdown, there was about 18 seconds to go before the "bingo" (fuel critical) call, but the meaning of that call is "land in the next 20 seconds or abort" -- if you're only 50 feet up at "bingo" and coming down nicely to a safe landing site, you press onward. 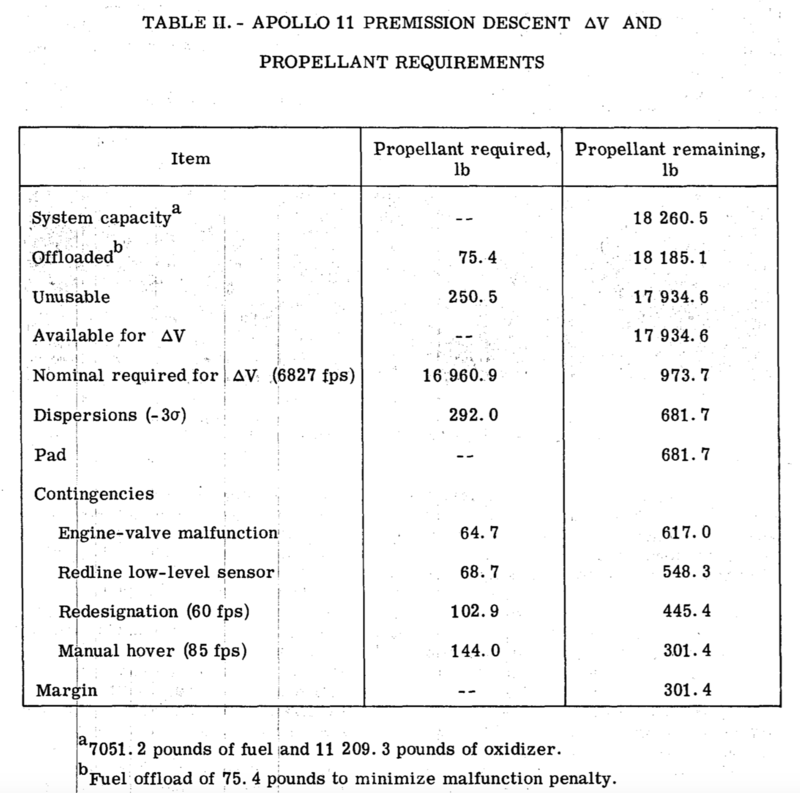 Apollo By The Numbers suggests that some 674 lbs (305 kg) of usable propellant remained at touchdown, meaning that the engine could have run for at least 45 seconds, and possibly as much as a full minute longer, before quitting. This is clearly a very conservative approach to propellant allocation. Development of the LM was severely weight-constrained, and one of the reasons that Apollo 10 was planned as a non-landing rehearsal flight was that the LM design was still a couple hundred pounds over-weight at that time; it's significant that costly hardware work was undertaken to solve the problem rather than simply whittling down the 300 lbs of "no particular reason" propellant margin. Not the answer you're looking for? Browse other questions tagged apollo-program fuel or ask your own question. How different was the Apollo LM descent trajectory from the most fuel-efficient? Apollo LM ascent procedure, computer controlled or manual? What were the differences on the LM ascent stage engines on Apollo 9, 10, and 11? Can landing modules use left over fuel from earlier stages?